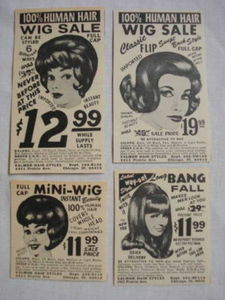 Four Valmor Wig trimmed original black and white ads from 1969-Valmor Hair Styles, Chicago, Ill.
Two measure approximately 2 1/2"x2 1/2", and the other two measure approximately 2 1/2"x4 1/2"
Two of the ads are for "100% Human Hair Wig Sales", and one is for "Full Cap Mini-Wig", and the other is for "Long Bang Fall"
These lightly tanned ads are in good condition. 1970's Glamour Wigs, Falls, & Curls Ad 14 Styles! 1945 South Africa Ad Harritz Hat Factory (Pty.) Ltd.